Neuschwanstein Castle is one of the world's most fanciful, recognizable and controversial buildings. Neuschwanstein Castle is a bizarre castle conceived by the "Mad King" Ludwig II of Bavaria, Germany. It was built in the 19th century but was designed as a fanciful recreation of medieval castles dating back to the 12th century (when bows and arrows rather than wall-smashing canon shells ruled). 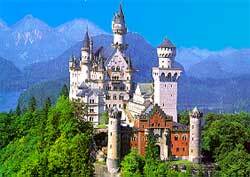 When you look at the photo of Neuschwanstein Castle, it's easy to surmise that Walt Disney's theme-park castles were inspired by Ludwig's fairy-tale design. The interior is just as whimsical as the exterior. Highly skilled craftsmen fashioned ornate rooms influenced by scenes from operas by Richard Wagner (Ludwig was his patron). Decorative work on many unfinished rooms in Neuschwanstein Castle was abruptly and permanently halted in 1886 when Ludwig drowned in a nearby lake. Some historians say Ludwig committed suicide, others that he was assassinated by political foes. Neuschwanstein Castle is a museum and popular tourist destination.